Can we build a branded city that works for everyone? Or are we heading towards a branded dystopia? Earth’s great cities are hubs of growth and innovation, but many are also beset with crumbling infrastructure, environmental pollution and growing social inequality. Around the world, governments are struggling to manage the rapid pace of change, while at the same time corporations seek to play a far greater role in civic life. With two-thirds of humanity predicted to be living in urban environments by 2050, according to the UN, cities need to be able to sustain the growing demands on their infrastructure. But if governments don’t have the resources to do this, will the role of city-maker fall entirely to private corporations? And if so, will the metropolis of the future become a branded utopia or a commercial dystopia? 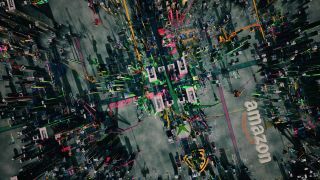 These are the questions that lie at the heart of The Future Laboratory’s new Smart Cities project, which the strategic foresight consultancy debuted at the inaugural SXSW Cities Summit earlier this year. Exploring three future scenarios of branded cities – preferable, probable and potential – it also commissioned Inferstudio to create original animations to bring the scenarios to life, from which you can see exclusive stills here. Smart cities will be at the core of any major branded metropolitan evolution, with networks of embedded sensors accumulating unprecedented amounts of data on the daily activities of its citizens. It’s already happening, with our digital selves existing on platforms owned by corporate giants, and our personal data being exchanged for enriched social, cultural and economic lives. But in the next phase of hyper-connectivity, integrated branded platforms will act as much more than this – they will define the very fabric of the city experience. Many urban dwellers already feel the benefits of living in such cities, even if they do not yet register the mechanisms by which they operate. The South Korean capital Seoul is one of the most networked cities in the world, using technology to streamline a city with twice the population density of New York. Its metro system handles 7m passengers daily, but few would notice the sensors that provide Seoul’s Transport Operation and Information Service (TOPIS) with real-time data. San Diego in California has a streetlight system that can detect parking spaces and notify the 30 per cent of downtown traffic driving around trying to find them. On the opposite coast, Miami has lights that can detect gunshots and notify the police to respond. Although citizens will notice little outward visible change from upgrading the existing urban fabric, the tacit benefits to their standard of living will be significant. But as we look to the future we must also learn from the past. History is littered with images of grandiose utopias that failed to function in the real world, of moribund company towns slowly being reclaimed by nature. And the interests of corporate entities will need to be balanced with the rights and interests of the population too. Anthony Engi-Meacock, co-founder of Turner Prize-winning design studio Assemble, believes that the built environment will be better when it follows a more heterarchical and less corporate structure: "Cities are always an outward manifestation of the economics that create them," he explains. "We need to be mindful in the future that they are run like communities rather than corporations." This article was originally published in issue 282 of Computer Arts, which is out today – buy it here. Read more from The Future Laboratory here and subscribe to Computer Arts here.